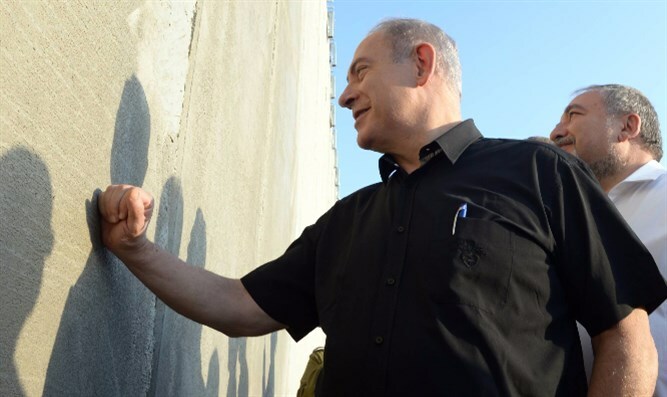 Prime Minister Benjamin Netanyahu surveyed the separation barrier today near Meitar, ahead of planned building for the security barrier in that area. He was accompanied by Minister of Defense Avigdor Liberman, Minister of the Interior Gilad Erdan and IDF Chief of Staff Gadi Eisenkott, and other security officials. Addressing future work on the security barrier, Netanyahu said, "We established that we will close breaches [in the security fence]. We will prevent illegal residents and attackers from reaching the cities of Israel. It's complicated, we need to guard the villages, and we of course need to deal with the whole chain of illegal activity, including employers and those that supply lodging and transport for illegals. "I think it's clear that this project will be finished. It's important for the security of the citizens of Israel and for the State of Israel." It will be remembered that work has begun on the barrier near Hevron, between Turqumiyah and Meitar, that will see the installation of a wall that will replace the security fence currently in place in the area. The new barrier is to be 42 kilometers long. Work on the new barrier is expected to continue for a year and a half. Until then, the IDF will continue to function in the area in a full capacity.